Members of the Middlebury College community turned out in force to honor the recipients of the 2012 Staff Recognition Awards on September 19 in McCullough’s Crossroads Cafe/Juice Bar. 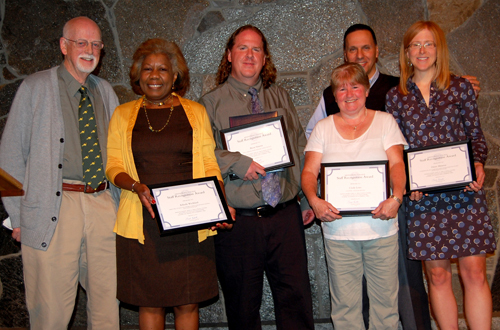 The recipients were Cindy Leno, team leader, custodial; Diane Munroe, coordinator, community based environmental studies; Brent Simons, Ross Commons dining manager; and Arlinda Ardister Wickland, director of student fellowships and health professions. The award program was established by Professor Emeritus of Sociology Rudolf K. Haerle Jr. as a way to recognize members of the staff who contribute to the vitality of the College community and support the College’s academic mission. The criteria for selection are leadership, stewardship, attitude, and community service. At the event President Ronald D. Liebowitz read a citation honoring each of the four recipients. Nearly 100 people attended and a buffet lunch prepared by Dining Services was served.